Herman Vandever is a very accomplished silversmith who works in a variety of styles, including overlay work and sandcasting. When using stones, he always uses superior natural turquoise. This soft-cornered triangular stone of natural, untreated Royston turquoise is particlularly thick and perfectly polished to lustrous finish. Herman created a two-tier border of saw and file work with the stone's bezel slightly recessed in a shadowbox. 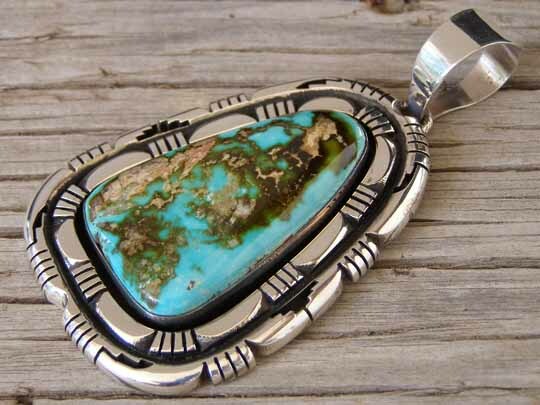 This is beautifully conceived and executed with a superior stone of natural turquoise. Match this with a fine strand of handmade beads (see below). Hallmarked Herman V in script and stamped Sterling on back. Dimensions of pendant (excluding jump ring & bale: 2 9/16" x 1 7/8"
Total hang (including bale): 3 3/8"